In all three books I’ve released so far I’ve had a dedication page. This leads into my next question. Do you, as a reader, ever look at the dedication page or do you skip by it without a thought? I must confess I don’t read them too often myself, especially when reading online, as Kindle will usually open a book at the start of the story, skipping the title and dedication pages. So is it even worth putting one in at all? This is what I’d like to know. If you’re a reader, do you ever pay attention to the dedication page or don’t you even look? And if you’re an author, do you always have a dedication page or do you think they’re not worth having? Also, have you ever come across any dedications that have stuck in your mind for some reason? Let me know in the comments section at the bottom of the page. Lovely and thought provoking post Lynne. Yes, actually I love to see dedications in books that I read. 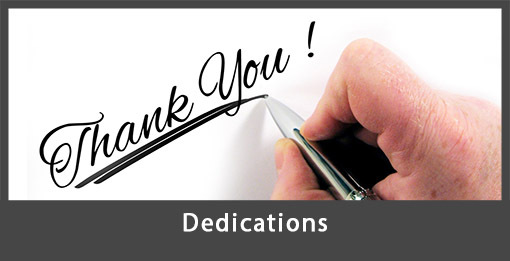 It is never a waste of time, even if the only people who read your dedications are the very people you are grateful for, it is so important to have done it. Personally, and maybe I am a wee bit crazy, but I always read dedications and acknowledgements. My Kindle is very naughty and always takes me to the first chapter, prologue or introduction … but I just press “go to” and read all those lovely words. It is nice to see what inpired people to write their, and also who travelled with them on their journey. Also it is always lovely to see others expressing gratitude. I read dedications. I read books from cover to cover literally. My favourite dedication was by a theologian (I’ve forgotten which one and Google was no help) who dedicated his book to ‘all librarians and keepers of books without whom this book wouldn’t have been written’ (or something like that). I was a librarian at the time and I felt quite chuffed. The most annoying dedications are the ones which say: to my wife and children who I haven’t seen for the last two years while I’ve been writing this book (or some version of this). It almost makes me not want to read the book because I don’t think sacrificing your family to that extent is God’s intention. Generally I find dedications moving and an opportunity to reflect on who has influenced your writing. Yes, I would hope people who write things like that are embellishing things a little, rather than being literal! I like to see them and read them too. It’s a nice, semi-permanent way for an author to express their esteem for the people who have been important to them. If the person has been part of the book’s inspiration, then it really makes sense. I’ve had dedications in some of my books but not all. Yes, as an author, I think sometimes they fit and sometimes they don’t. I think I will put one in my new book, though, now I’ve thought of an appropriate one. Always note the dedications, but rarely bother with reading an acknowledgment page. Great post. I do like reading dedications because it gives an extra glimpse into the author’s life. Karen Kingsbury writes really long dedications to her husband and six children in every book, often going for several pages. It would be a great keepsake for the family, as it chronicles their lives over the years, but I usually skip them as they’re way too long. I’ve also seen the other extreme where the author just says something like ‘For Anne’. To me that’s sort of a let-down. If they’ve written a beautiful book that I love, I wonder why they couldn’t have put some more thought into the dedication. As the dedication is often the first thing you see in a book, it gives an insight into the author’s writing style and heart. So for me the best dedications are shortish (no more than a few lines), but say something heartfelt and meaningful about the person. And I hadn’t thought about that point re Kindle. I’ve probably been missing a lot of dedications. Yes, you do miss them on Kindle. And yes, I think they can be too long but also too short. I like to include a bit of info so the reader knows why I’m dedicating my book to this particular person.